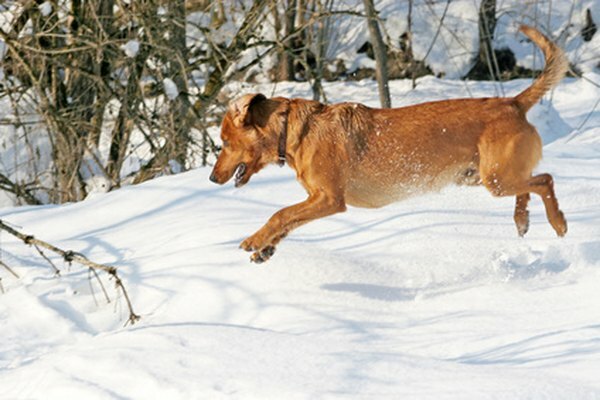 Active and athletic dogs may develop bone spurs. Bone spurs, or osteophytes, form when extra bone forms on top of normal bone to repair an injury or with age. In dogs they occur most often in the joints of the legs, including the feet, and in the spine. Bone spurs can symptomatic of generalized osteoarthritis. Severe trauma or constant stress on a joint can cause bone spur formation. Canine athletes that compete in flyball, agility and other dog sports can develop bone spurs from both causes. Older dogs are likely to develop bone spurs because the cartilage that lines their joints is thinning with age. Overweight dogs have constant stress on their hips, knees and ankles just from supporting their own body weight. You can help prevent bone spurs in your dog by regulating his activity. Exercise him regularly with a daily walk on the leash. If you can't walk with him, hire a dog walker or put him on a treadmill. Think of yourself as his trainer -- if he likes to romp, run and play, that's fine, but warm him up before heavy exercise to prevent joint injury. Monitor his weight regularly, about once a month. If you can pick up your dog comfortably, weigh yourself on your bathroom scale alone, then again with the dog in your arms. Subtract your weight to determine his. If you can't, take him to a large pet store or to the vet's office -- they're usually happy to oblige. Get an ideal body weight for your dog from the vet and consult him about any significant change, up or down -- for toy dogs a few ounces may be serious; for big ones the change may be as much as 5 or 10 pounds. Make sure your dog can be physically comfortable. This means having a space where he can stretch out full-length on his side with good support underneath him to prevent pressure on his joints. His bed area should be warm and draft-free when the weather's cold, and cool (in the shade or in air-conditioning) when it's hot. Elevate your dog's food and water bowls so that he can eat and drink without straining his neck, but be aware some vets recommend against elevated feeders, particularly for certain breeds. If your dog has bone spurs, follow his veterinarian's recommendations. These may include medications such as NSAIDS (nonsteroidal anti-inflammatory drugs, including regular aspirin and prescription Rimadyl or Etogesic) for pain and inflammation; and Cosequin, GlycoFlex or Adequan to strengthen and rebuild joint cartilage. He may also recommend other therapeutic modalities such as physical therapy and acupuncture. As a last resort, he may offer surgery to fuse painful joints; this can relieve pain and allow the dog to become mobile again. You can help your dog deal with bone spurs by providing a ramp so he can walk up into the car instead of jumping. You can also offer a little physical help over any rough spots, like a boost going up steps or a gentle lift getting up first thing in the morning. Bone spurs aren't always painful, and they are mostly discovered during examination for a different problem. No one has yet figured out a cure for old age; but with your careful management, proper nutrition and good veterinary care, a dog with bone spurs and even advanced arthritis can lead a happy and comfortable life.